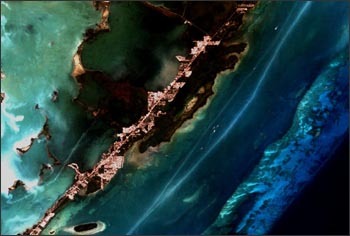 A Landsat 7image of a coral reef near Key Largo, Florida. Overseas Highway (Interstate 1) and the development and marinas along its flanks can be seen in white running from the upper middle to the lower left of this image. NASA satellite data was used to help monitor the health of Florida’s coral reef as part of a field research effort completed this August and September. The project was the first comprehensive assessment of the resiliency of reefs along the entire National Marine Sanctuary that stretches about 300 miles from Martin County to the Dry Tortugas in the Florida Keys. Scientists are trying to determine why some reefs are resilient to environmental changes and impacts. The work may also identify ways to care for reefs worldwide. At nearly 175 sites, scuba divers recorded the number and species of coral and the extent of bleaching — corals turn white when tiny algae that live inside them die. Bleaching is a symptom of coral stress, which can be caused by high water temperatures, other environmental stresses, or disease. The project was part of the Florida Reef Resiliency Program, funded by the state of Florida and The Nature Conservancy. It involved volunteers and researchers from several agencies, organizations and universities, including the University of South Florida. Data from the MODerate-resolution Imaging Spectroradiometer (MODIS) aboard the Terra and Aqua satellites gave accurate, up-to-date information on sea surface temperatures to identify areas vulnerable to bleaching. The data was also used to measure the cumulative heat buildup over several weeks, shown to be particularly important to the health of reefs. “MODIS imagery is beneficial because it provides more detail than traditional satellites, allowing us to detect conditions down to hundreds of meters – the size of individual reefs,” said Christopher Moses, University of South Florida, Tampa, Fla. Researchers also used the recently developed Landsat-based Millennium Coral Reef Map to determine which reef areas were most appropriate for sampling. Funded by NASA and created at the University of South Florida, the global map divides Florida’s coral reef into about 70 different reef zones. After the findings from each sampling site are analyzed over the next few months, scientists will be able to identify the factors, including genetics, that may make some types of coral resilient to adverse conditions and bleaching. By mapping these healthy regions, officials can then attempt to simulate those conditions elsewhere. Climate conditions, especially sea surface temperatures, are considered a major factor in coral reef health. Bleaching events typically peak when waters reach their warmest levels, usually in late summer and early fall. Phenomena like El Niño have also been linked to declines in reef health. During the strong El Niño of 1998, about 30 percent of coral off the Florida Keys died after a single mass bleaching. Coral is a rocklike deposit of skeletons from marine animals that accumulate to form reefs, providing habitat for more than 1 million species of plants and animals while also protecting coastlines from storm damage and erosion. Researchers say that up to one-fifth of the world’s coral reefs have been destroyed, but programs like the Florida Reef Resilience Program bring scientists, reef managers and the community together to develop strategies that improve the health of reefs while enhancing the economies dependent on their success. Continued monitoring of coral reefs with the aid of sophisticated data from NASA satellites will help identify the causes of bleaching and ways to prevent it so that the impact of climate and man on these vital ecosystems can be minimized. This entry is filed under Carbon and Climate, Ecosystems and Biodiversity, News, Water.